Courtyard LA is a online vintage clothing store with a few original pieces. Based in Los Angeles, as you could probably garner from the name, the store resells vintage sweaters, shirts, Levi’s jeans, and more. The owner also put forth her own collection on the site which includes beautiful poet blouses and graphic tees. Prices range from $24 to $165 with a majority of their items falling in the $30-$60 category. Shop Tunnel Vision is an online vintage store that sells clothes for “Deadbeat Lowlife Weirdos,” but don’t let that scare you. The impressive online store includes a blog, original artwork, vintage clothes by decade, links to their Spotify playlists and Tumblr accounts, and plenty of clothing. Sometimes everyone needs a little 2000s diva or goth in their lives. They sell everything from jewelry to down coats, all sourced in the LA area. The business is run by Madeline Pendleton, who is a designer, illustrator, buyer, and owner of the shop. I am so amazed by their site and I am so lucky to have had the privilege of interviewing Madeline who has single-handedly built such an impressive online retailer. 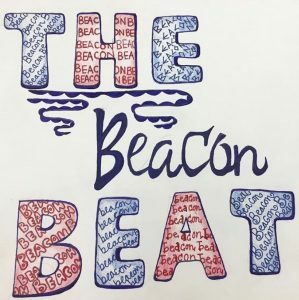 The Beacon Beat: How did this company come about? What did it start out as? Madeline Pendleton: Tunnel Vision was started in 2012 by me, Madeline, and a business partner I had at the time who left the company in 2013 to pursue her own brand. We started the store as an online store with the intention of selling ethical and recycled clothing to an audience that traditionally would favor more destructive clothing production methods, like fast fashion or big box clothing chains. TBB: How do you remain sustainable? And what are some challenges you face within that? MP: We started out wanting to use local production methods only, with our house brand sewer being one of our friends’ moms who was being mistreated by a local factory here in Los Angeles and quit to pursue working for herself. However, as the brand has grown, we have found it increasingly difficult to be both profitable and produce locally. This has led us to branch out and seek overseas production methods that are also eco-conscious and socially responsible. As a result, we work with brands like Bella and Canvas, who makes the blanks we screen print a lot of our products on. They own their own factory overseas with a commitment to ethical production methods. We’ve also partnered with overseas jewelry manufacturers who insure ethical product standards. It is always difficult, though, trying to give our customers prices they are comfortable with, without exploiting laborers. Sometimes, I worry that the fashion industry has gone so far into the side of cheap unfair labor that it’s impossible to exist as a business without it. But, we hold onto our principles as best we can, and it is always a challenge trying to find the balance. TBB: What do you look for in a piece of clothing when you’re thrifting? MP: We source our vintage from a variety of places, but we don’t really “thrift”. A lot of our product is purchased by-the-pound at local outlets for clothing that cannot be sold at thrift stores, actually. We literally dig in giant piles or boxes or bins of clothing trying to find the best of the best hidden in there. Sometimes, the bins smell horrible. Sometimes, they are inexplicably wet. Sometimes, there are literal rodents in them. But we always rescue great garments that would otherwise be thrown away and just need a little TLC. These are mostly garments with minor damages that can be repaired, or garments that are out of style or out of date — which is great for a vintage look and works really well for us. We also rely on local rag houses. We look for pieces that are fashionable now and still have some life left in them while telling a story. Fashion is cyclical, and it’s great to find a piece from the original era contemporary fashion references. TBB: Who is your ideal customer? MP: Our ideal customer is someone who loves the look of vintage clothes, but has a higher shopping expectation that a Depop or eBay or thrift shop customer, for example. We are looking to target middle class customers who would otherwise be shopping at big box fast fashion retailers, and our goal is to convert them into secondhand customers by presenting the clothing in a shopping manner to which they are accustomed — on a professional website styled with fashion-forward and contemporary accessories. TBB: Is there one special item/shoe/print/article of clothing that you have been dying to find? MP: We are always on the lookout for vintage chunky boots and shoes! It is so hard to find them, though, especially in good condition. Even deadstock shoes from other eras are often made from non-leather materials, which means that they peel from sitting even unworn for years. A good shoe is the elusive hard-to-find gem of vintage sourcing. LA With Love is a Los Angeles-based company that specializes in handmade and affordable lingerie. Their prices are very reasonable considering lingerie can be expensive. They sell swimsuits, bodysuits, nightgowns, bras, and underwear. Their prices range from $17-$80 with most items being priced somewhere in the middle. The company’s designs are a 2019 take on lingerie while using classics materials and styles. This is an Instagram based shop that makes sales through direct messaging and PayPal. The owner recently acquired an appointment-only space for styling vintage clothes. They have a very impressive collection of dresses, tops, and shoes from as early as the 1950’s. Most of her items are anywhere from $17-$50 and dresses are usually around $35. I love Daizy Lemonade because they sell a lot of items in a wide size range. Sometimes online shops only sell clothes that are around the owner’s size, but Daizy Lemonade ensures that everyone feels represented and is able to buy clothes. I’m a Medium-Large for most items and bottoms so it was great to see that the shop was selling very fashionable pants and skirts that I could actually wear. Tots Apparel is a smaller company, in comparison to the other stores on this list because it is owned, designed, and operated by a college student! Unfortunately, the student is taking a break to focus on her studies and creative process until this spring, so head on over to the shop while you can! Tots Apparel combines sportswear and classic prints with the modern Crop Top. Most of the pieces are reworked or altered items from thrift stores and some include the likes of Tommy Hilfiger, Levi’s Jeans, and Adidas. Among my favorite pieces are her Distressed Levi’s Bralettes and her Neon Green zebra-print crop tops. The designer, listed on the site as “Baby J” started off selling the clothes she wanted to get rid of in her closet but now the website sells 90’s-inspired items internationally. Based in DC and Atlanta, the store is a great example of the power of the internet, a great sense of style, and originality. All of the items are under $35. WANTS is a relatively new online store that specializes in gorgeous accessories and unique and modern business-casual clothing. I found them on Instagram through a model who was wearing their tops. Upon further investigation, I saw that even singer Jorja Smith sports their beautiful blazers! The name of their brand is an acronym for “We Are Not The Same” as the brand encourages individuality and breaking from mainstream fashion. They strongly believe that “everyone should be able to express their style without having to break the bank to do so.” They also only sell a limited number of each item so that you’ll never be caught dead wearing the same thing as someone. Their items range from $30 to $200, but most of their tops and pants are between $40 and $80. They also have an amazing sale section and tend to markdown their pieces. My personal recommendation would be the “Pink Puffed Sleeves Blouse” which is ON SALE for $60. Shop Hot Lava is an online store that only features around 70 items but each piece is different yet cohesive. The shop specializes in fun graphic tees, bold pants, and kooky prints. I stumbled on the small shop through one of my favorite models, Lulu Bonfils, who you can find at @louisvuittoncrocs. She sported their Checkerboard Denim Pants that come in a wide range of sizes. I love the style of their clothes because it features simple cuts with really interesting patterns and execution. I have a feeling that if they were to be picked up by another online retailer they would become huge. Their name alone “Hot Lava” makes for awesome t-shirts and frankly, it’s just fun to say. Their prices range from $17 to $88 dollars with pants being their more expensive items. Check them out before their stuff goes to Urban Outfitters!! Run!